As in other industries, the costs of raw materials, manufacturing, promotion and distribution of tobacco products are important in determining profits to tobacco growers, manufacturers, wholesalers and retailers. However, because tax is such a substantial component, the level and nature of tobacco duties, fees and taxes—rather than production and marketing factors—historically have been the main determinants of the final retail price of cigarettes over time in Australia as in most developed countries. 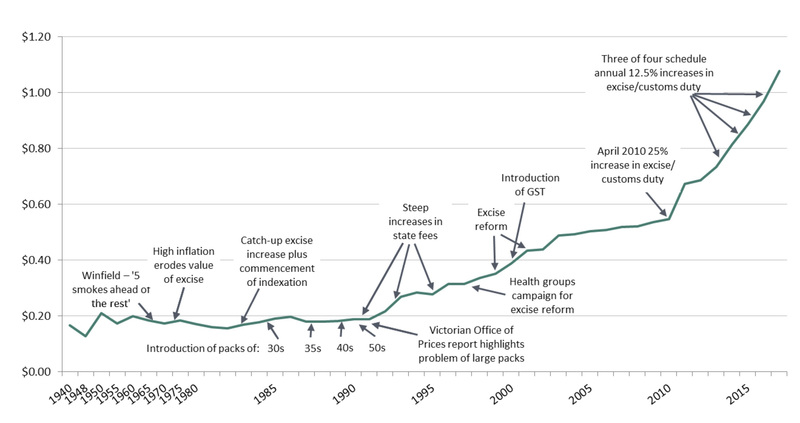 This section examines the extent to which increases in tobacco taxes have resulted in rises in the price of cigarettes and other tobacco products in Australia. It outlines efforts by manufacturers to reduce the impact of increases in taxes, both by minimising tax liability, by encouraging discounting at the retail level, through differential pricing of particular brands and by varying the bundling of cigarettes and other tobacco products to affect upfront purchase price and unit cost. Since 1940, the NSW Retail Tobacco Traders' Association has been printing and distributing to small retailers in all states and territories lists of the wholesale and recommended retail prices for cigarettes and roll-your-own tobacco produced by major international tobacco companies, and virtually all cigars and pipe tobacco, sold in Australia. 1–4 i Copies of the publication preserved at the National Library of Australia and several other libraries throughout the country provide recommended prices for tobacco products available for sale in any state or territory since that date. Recommended retail prices for Craven A Cork Tip 20s—a brand of cigarettes popular in the 1940s, '50s and '60s in Australia, and one of a handful of brands available in 1940 still available in 2015ii—are listed in Table 13.3.1. When examining the cost of tobacco products over time, it is useful to take into account the effects of inflation–the costs of buying all goods and services. Table 13.3.1 also indicates the price adjusted to take into account changes in the Consumer Price Index (CPI). (The CPI uses 2012 as the base year, the year when the index is set to 100, so it is convenient to express prices in 2012 dollars.) This table also shows the current and 2012 pack price for Winfield 25s, the Australian brand with highest market share between the late 1970s and 2015—refer Chapter 10, Section 10.6. Figure 13.3.1 plots the price per stick of Craven A 20s and Winfield 25s in $2012 from 1940 to 2015. Table 13.3.1 shows that the current price of a packet of Craven As increased 160-fold between 1940 and 2015. However, as is evident from Table 13.3.1 and Figure 13.3.1, adjusting for inflation, Craven As cost no more in the early 1990s than they did in real terms during and immediately after the Second World War. Prices then increased substantially from the early 1990s. In real terms the stick price of Craven A in 2015 was almost five times higher than in 1940–reaching $1.14 per stick in 2015. Between 1980 and 2015, the stick price of both Craven A and Winfield increased more than five-fold in real terms. It is also important to consider the pricing of popular alternative tobacco products when examining the price of cigarettes. In Australia, the most common factory-made (FM) cigarette alternative is roll-your-own (RYO) tobacco. RYO tobacco and FM cigarettes have been essentially taxed at the same rate, so that the tax per 0.8 grams of roll-your-own tobacco is the same as the per stick rate for most FM cigarettes—see Section 13.2.1. However, because most RYO users roll less than 0.8 grams of tobacco per cigarette, RYO tobacco provides a cheaper alternative to FM cigarettes. Further, as more budget brands and smaller pouch sizes have entered the RYO market in recent years, the up-front cost and price per cigarette of RYO products have provided a reliably cheaper alternative to FM cigarettes. 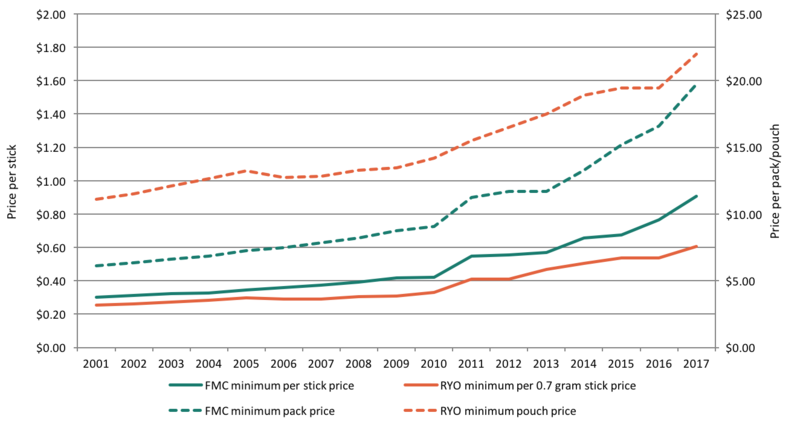 Figure 13.3.2 compares the recommended retail prices of the lowest-priced available FM pack and RYO pouch, and cheapest available FM stick and RYO stick prices (assuming 0.7 grams of tobacco per RYO cigarette), over time. Prices for all items have increased over time, particularly since 2010. However, the rate of increase for FM packs and sticks is greater than that of RYO products. The effect of this is two-fold. First, the gap between the price of the cheapest available RYO pouch and the cheapest FM cigarette pack (i.e. those with the lowest up-front purchase price) has shrunk. In March 2017, a 20 gram pouch of RYO tobacco cost only $1.30 more than the lowest-priced pack of 20 cigarettes, but would yield around 8 more cigarettes. In contrast, in 2001, the cheapest pouch of RYO tobacco cost was almost double the price of the cheapest FM cigarettes. While the cheapest RYO pouch in 2001—a 30 gram pouch—would have yielded substantially more cigarettes than the pack of 20 cigarettes, the upfront cost to the consumer was substantially more. The introduction of pouches of 20 gram RYO tobacco to the market in 2016 further slowed the rate of increase of minimum RYO pouch prices in later years. Second, Figure 13.3.2 shows that gap between the cheapest FM cigarette stick and cheapest RYO cigarette stick (at 0.7 grams) has progressively widened since 2001, particularly since 2010. The per stick price represents the best value for the consumer, that is, the most economical option available. The cheapest FM cigarettes were only $0.05 more expensive than the cheapest RYO cigarettes in 2001. This can also be expressed as a ratio of 1.2, meaning that for each FM cigarette, a smoker could purchase 1.2 RYO cigarettes for the same price. In 2017, the price difference between the cheapest RYO and FM cigarettes was six times higher at $0.30. A smoker could afford 1.5 RYO cigarettes for the price of the cheapest FM cigarette. Cigarettes in the early part of the century were commonly sold in packets of 10 or 20 or in tins of 50. These were similar in size to the tins in which loose tobacco was commonly sold. With the advent of plastic wrapping, however, these tins disappeared and by 1960 the vast majority of cigarettes were sold in packets of 20. The increasing rate of state licence fees had a significant impact on the price of brands that were popular until the early 1970s. However the tobacco industry fought back to retain its customers and the introduction of Winfield 25s—'5 smokes ahead of the rest'—in 1976 marked the advent of the large pack size in Australia. Until 1999, Australia was virtually the only country in the world that combined an excise based on weight and ad valorem fees based on wholesale value of sales. Until 1999, lighter cigarettes attracted less federal excise and customs duty than heavier cigarettes. This effect was amplified by the manner in which ad valorem fees were imposed and final retail price calculated, providing an incentive for lighter cigarettes and for packaging many cigarettes in the same packet.12 The introduction of large pack sizes in Australia closely followed the introduction in 1975, and subsequent doubling in about 1987, of state franchise fees throughout Australian states. In most other countries in the world, cigarettes are virtually always sold in packets of 20. While the price per stick of the most popular brand rose quite sharply as a result of a number of increases in duty and state licence fees on tobacco (Figure 13.3.3), the per stick prices of large packs of cheap brands remained substantially lower than the market-leading pack—see Table 13.2.2. Not surprisingly, large packs quickly became a dominant component of the market (see Table 13.3.3). While the recommended retail prices of premium brands of cigarettes such as Marlboro, Dunhill, Benson and Hedges and Craven A—brands available in packs of 20s and 25s—rose steadily from the early 1980s, consumers concerned about price have always been able to purchase cigarettes that are substantially cheaper per stick. As of 2017, large packs in Australia include 30s, 35s, 40s, 43s, 44s and 50s, as well as a range of smaller packs in 20s, 21s, 22, 23s, 25s, and 26s. Figure 13.3.3 plots in more detail the per stick price calculated from the recommended retail price of the leading brand of cigarettes of each year over time, indicating some of the major changes in taxation arrangements between 1940 and 2017, and some of the major innovations with which the industry responded to those changes. Once again, Figure 13.3.3 shows that the effects of early increases in state licence fees were mitigated by the introduction of larger and larger pack sizes providing cigarettes at a cheaper cost per stick than those available in smaller pack sizes. It was not until the very large increases in state fees and excise duty in the mid-1990s that cigarettes became significantly more expensive. Recommended retail prices changed little before the 1990s, then increased steadily over the late 1990s so that, in real terms, by 2001 the recommended retail price of cigarettes was three times greater than what it had been in 1948. The effects of the 2010 and 2013-16 increases in excise and customs duty are also clearly evident. The recommended retail price of the most popular cigarettes was two and a half times higher in 2017 than 2001 in real terms. As outlined in Section 13.2.1, health groups argued for reform of tobacco taxes12, 14-16 and a new system was introduced between 1999 and 2001. Table 13.3.2 and Figure 13.3.4 show the pack price for Horizon and Holiday 50s rising above $30 in February 2013, and then both exceeding $40 in March 2016. In March 2017, it cost $20 more to buy a pack of Horizon 50s than a pack of Winfield 25s. Over time, there has been a dramatic widening of the difference between the highest and lowest priced packs. For example, in 1992 a pack of Winfield 25s could be purchased for about three-quarters of the price of a pack of Horizon 50s, while in 2017 the purchase price of a pack of Winfield 25s was 60% of a pack of Horizon 50s. As of 2017, Holiday 50s were no longer included in price lists (all Holiday products have been delisted), while Horizon 50s were priced just under $50. Note: Price at February of each year for 1989-2013, then at March of each year for 2014 onward. Recommended retail prices from Victoria from 1989 to 1997, then for all of Australia from 1998. Note: No Holiday products listed in 2017. † Recommended retail prices from Victoria from 1989 to 1997, then for all of Australia from 1998. The proportion of cigarette sales that were of larger pack sizes (i.e. 30s and larger) in Australia are provided for years for which this is available—refer to Table 13.3.3.